"...the students and teachers raved about your show!" Benny Buettner:: Co-founder of Magic Circus, with over 20 years professional experience in Europe and America. Member of SAG-AFTRA, Benny has been featured in several films, including Dr. Dolittle and The Princess Diaries and in the television show Nash Bridges. He performs and teaches in the Bay Area with Young Audiences, Youth in Arts, A Live Act and Fair Players. In Stockholm, for the Swedish Government he developed the children’s programs “Video Now” and “Anti Drug Theater”. Benny is a current member of the improvisational theatre group Bay Area Playback Theatre, www.BayAreaPlayback.com. An award winning magician, he is known by his stage name, Benny Bendini. Award-winning multicultural learning! Students are delighted by 30 multicultural, quick-change characters, distinguished by one shape that changes into hats from a variety of cultures and professions. 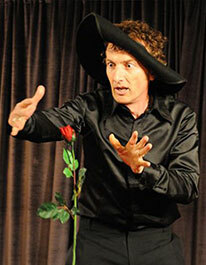 Vignettes with comic situations and visual jests are presented, using comedy, magic, mime, music and “chapeaugraphy”. Well-known, historical and international characters are brought to life, accompanied by sound effects and famous musical scores. - A comical traveler daydreams while waiting at a train station, and launches an imaginary journey around the world and through history. - Historical characters include George Washington, Napoleon Bonaparte, Neil Armstrong, Elvis Presley, and many others. - Visual jests and situations portray characters from North and South America, Europe, India and Asia in historical context.